The robot being developed by Rheinmetall Canada has been starring in the company stand at many past exhibitions. The main difference now is that it is not anymore a developmental item but has become a product, the Mission Master (MM). 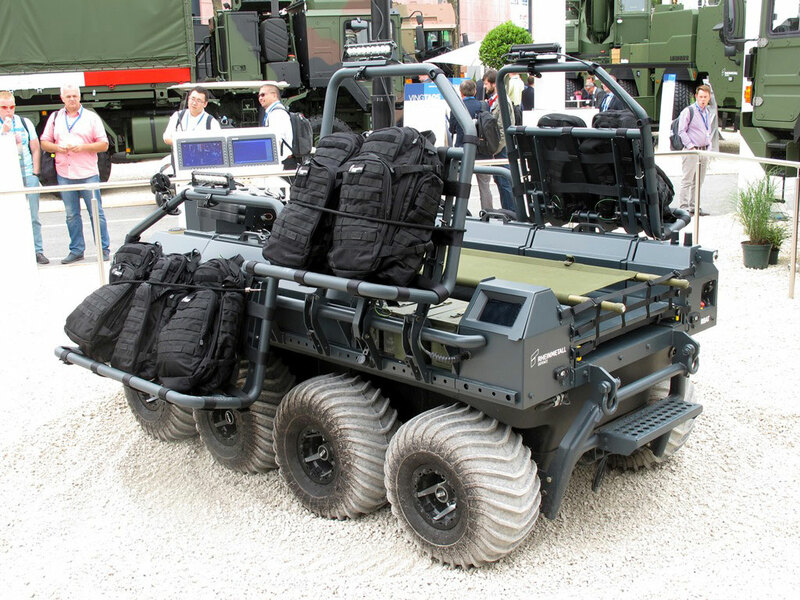 Shown in public for the first time, the Mission Master was fitted as a cargo mule, with potential MEDEVAC capabilities, however in the precinct where the UGV was moving other mission modules could be seen, an RCWS armed with a 12.7 mm machine gun among them. A lot of the “brain” has been put on-board the vehicle in order to make it as autonomous as possible, although the MM can still be remotely controlled, the on board touch screen located back left, which allows doing the planning, being detachable, permitting to operate the vehicle up to 100 meters distance. 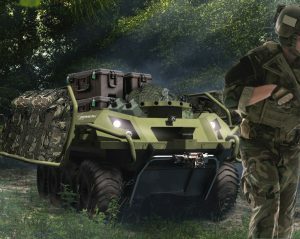 The MM is based on a commercial 8×8 platform, more precisely the Avenger manufactured by Argo of Canada; in fact only the chassis is left, the gasoline engine having been replaced by an electric motor, lithium ion batteries providing an endurance of around eight hours. 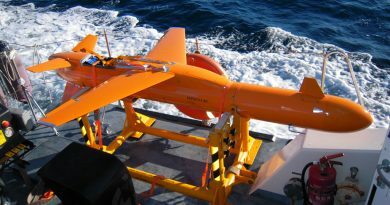 To allow an easy reconfiguration of the vehicle the MM is fitted with a CAN-Bus that permits a plug-and-play installation of the subsystems. Compared to the prototypes seen in the past the production system has a different suite of sensors, as it now features one 3D LADAR at the front and one 2D LADAR on each other side. Two cameras are fitted, front and rear, although four can be installed as option to cover all 360°. A radar can be fitted as option to increase the vision range. 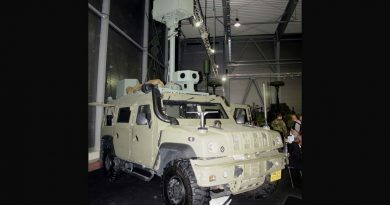 Two satellite receivers are installed, the vehicle being able to work with any constellation, an inertial system as well as a digital map of the area of operation being also part of the navigation suite, allowing the MM to operate in satellite-denied areas for a relatively long period of time. 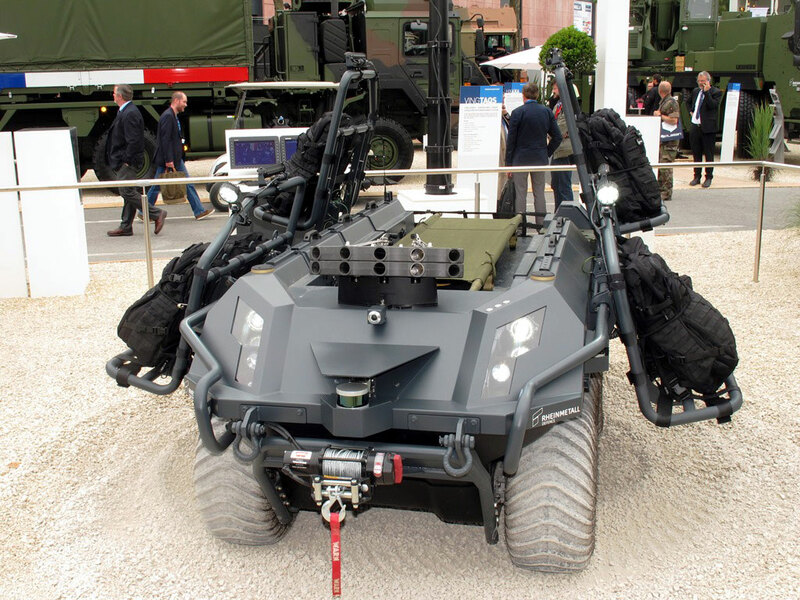 In a typical semi-autonomous function the MM can operate in the “follow me” mode, more than one vehicle being used to carry the unit load. 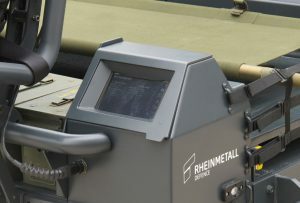 Rheinmetall Canada put a lot of effort in designing the transport interface: racks installed on the sides for rucksacks can easily be lowered to become seats, for transporting i.e. wounded soldiers, while a litter can be installed on the top in place of the payload. All along the vehicle we find 16 configurable mission modules, containers that can be used for different purposes, i.e. 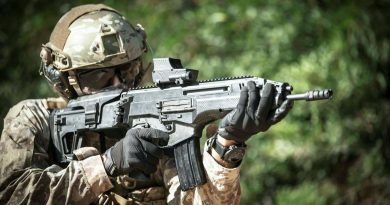 ammunition re-supply as they are compatible with NATO ammo boxes. At around 750 kg dry weight, the MM has a payload just less than 400 kg when used in the amphibious configuration, which increase to over 500 kg when operated on the ground. The MM can be embarked into CH-53 and CH-47 helicopters. 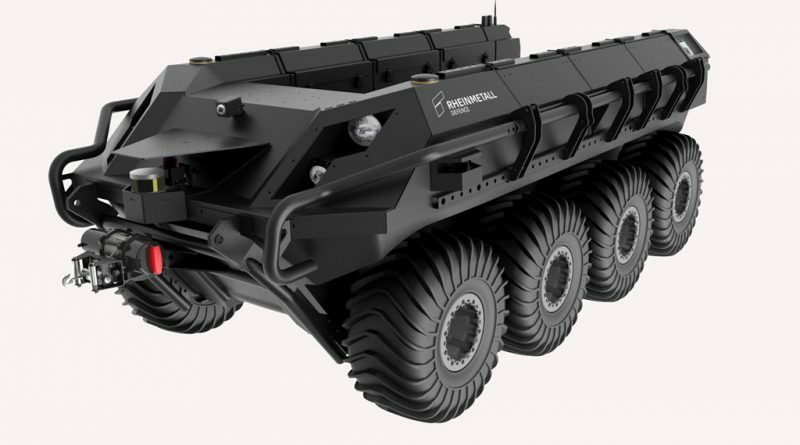 Rheinmetall Canada intends to continue evolving the MM, increasing its autonomous capability and the capacity to operate in swarms of UGVs conducting the same mission. 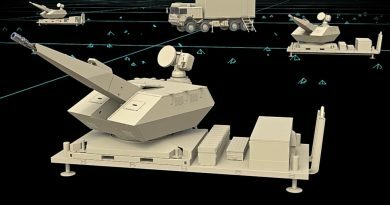 The company will also continue working on possible payloads, those particularly “power hungry” might well incorporate an APU in order to avoid draining power from the batteries.